Angular 7 project with source code for download. All data in the input array need to be read. Reading the data is fast and 400,000 events can be read without any noticeable delay. The Scheduler only reads data for the date range defined using startDate and days (visible in the grid). If you increase the date range the processing time starts to increase. You can test it by displaying 30/60/90/365/1000 days. The event rendering is optimized by default. 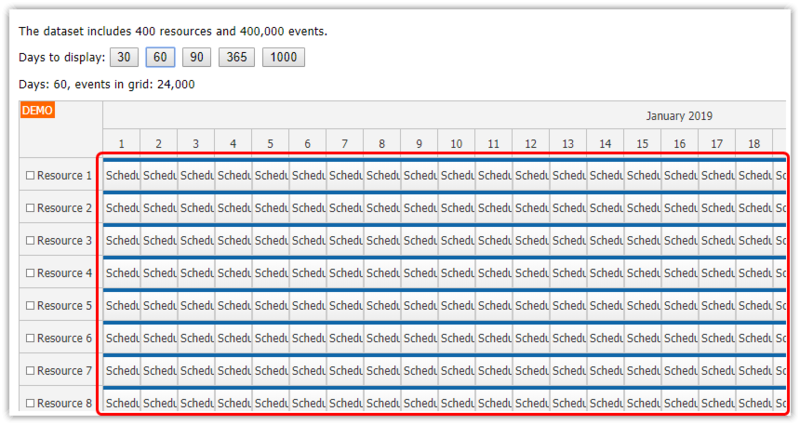 The Scheduler only renders the current viewport, additional events are loaded during scrolling. This means the total number of events has minimal influence on the rendering speed. Returning 400,000 records would mean significant stress for the database. The size of the JSON with all the event data is about 46 MB (48,788,001 bytes). If gzip compression is enabled, the size can be reduced to 4.8 MB. This still means significant download times (theoretical speed is 4s @ 10 Mbps). See also Angular Scheduler Performance. This testing Angular project focuses on raw client-side performance and it loads an extremely large data set at once. The Scheduler can handle a lot of data but it's not the only component of the final system. Loading large data sets at once has extreme demands on the server and network. In real-world scenarios, it's much better to load the data in smaller chunks during scrolling.